Craftster Community > CITY GUIDES FOR CRAFTSTERS > CANADA > A canadian willing to cut and dye my wedding dress? 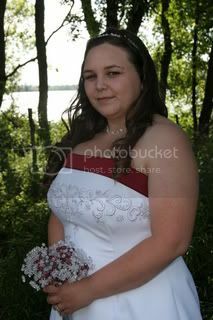 A canadian willing to cut and dye my wedding dress? Yes, maybe this should go in opportunities, but I want a canadian so not so much shipping back and forth . . . .
My husband (the cheater) and I have just recently seperated after only 6 months of marriage. ANYWAY, I've got this beautiful dress that I don't want to sell because it may curse someone. And I reallllllllllyyyyy loved it. So, I've decided to get it made into a corset top and get it dyed black. Anyone willing to do such a thing? Can it be done with all the beadwork?? I don't really mind TOO much if that has to be taken off. I would definatly like to keep the burgendy colour though on the top strip and the back corset ties . . . yes, it is already a corset backed one. I can send you more pics before you accept. It would also have to be made quite a bit smaller due to my "breaking-up-with-your-husband diet". To save on shipping, maybe I could even cut the skirt off myself . . . Thanks to anyone who replies!!! Re: A canadian willing to cut and dye my wedding dress? Oh I wish I could help you! Thats a great idea you have to recycle your dress. Not to mention I am sure the finished project would be amazing! My clever idea I had was to burn mine for the same reason of what you are going through! LOL! Hugs to you my friend and best of luck! aww, I remember when you posted all your wedding pictures! the best revenge is living well and it seems that you are determined to do that! I wish I could help too but I live not in Canada I'll bet you could even make a little jacket with the skirt part. It could be a full skirt on its own but you might be more likely to wear a little jacket than a big skirt. To slim up the top you'd just have to take in from the sides. The lining might be rough but I am sure someone around here would love a challenge!!! Stay strong and live well regardless of the schmucks you may run into! I'm sorry I can't help but I wanted to say good on you for turning a negative into a positive! Don't let the prick get the joy of knowing you have burned something you really love - turn it into a fabulous merry-widow to show off to your next lover . Good luck and I hope you can find your Canadian fairy godmother. I can't help with the sewing, but thought you might like to know that with Canada Post is actually costs MORE to send to Canada than it does to the US. I agree that the dress is gorgeous, and that you're awesome to remake it over into something you can enjoy. I'll bet you could even make a little jacket with the skirt part. OMG, I never thought of that!!! How clever!! there must be tailors/seamstresses in your area that would be up for the challenge... check the yellowpages.